A selection of client testimonials are presented here. See also our gallery section and our featured projects. "The result was extraordinary, and aesthetically elegant, in spite of its impressive proportions. 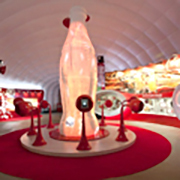 I would therefore have no hesitation in recommending Tectoniks Limited to prospective buyers"
“Tectoniks was briefed to develop the structure for our new asset Coca-Cola World. We aimed to create memorable experiences for our guests that honoured our history; celebrated the present and made a positive impact for a better future. We wanted a structure that would be warm and inviting just like the internal experience. This was successfully achieved using a triple-structure, designed and manufactured by Tectoniks, that was immediately aesthetically associated to the Brand. The structure had overall dimensions of 81m x 36m x 13.5m and weighed close to 6 tonnes. With a high density tour schedule in mind, one incorporating potentially short periods at each location, the building had to be designed with a fast installation time in mind, and the ability for a speedy turn-around. At the same time, strict health and safety, as well as environmental regulations, needed to be adhered to, including withstanding wind speeds of up to 90kph. We selected Tectoniks to design and build the structure because of their impressive portfolio, and obvious capability of producing high-quality products on a scale far larger than those of their competitors. Tectoniks exhibited professionalism from the early stages of tendering, through to project delivery. We were also impressed by their creativity on the shape of the structure. 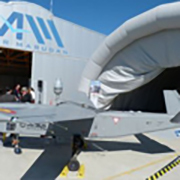 They have unparalleled expertise in the field of inflatable structures, and despite the challenges presented by this project, we felt continually at ease that Tectoniks would produce the best product. 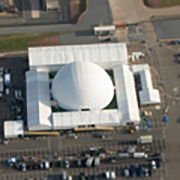 "The end result was excellent, the overall look of the dome provided the clean and crisp environment we were striving for, and its sturdiness was as specified even in high winds"
WRG worked closely with our partners, Tectoniks, on the production of the South Hook Inauguration in May 2009. The event was attended by Royalty including Her Majesty the Queen, and His Highness the Emir of Qatar, to officially launch the new LNG terminal that receives its supplies from Qatar. WRG were tasked with creating a show that enhanced the great engineering feats of the terminal itself, and to do this we chose to house the ceremony within a large-scale dome. The dome is still the largest fully inflatable hemisphere ever constructed. Due to challenging build timescales the dome had to be designed with quick erection timings in mind. Similarly the dome had to meet strict health, safety, and environmental regulations including withstanding wind speeds of 70kph. WRG chose Tectoniks to build the dome because of their professionalism from the outset. The team clearly has unrivalled knowledge when building inflatable structures, and with the short timescales available WRG felt comfortable that Tectoniks would come up with the best solution. The end result was excellent, the overall look of the dome provided the clean and crisp environment we were striving for, and its sturdiness was as specified even in high winds, thus allowing us to install our scenic elements to precision within the space. "(Tectoniks) have an unrivalled reputation for delivering high specification, innovative inflatable structures to demanding schedules and we have certainly found this to be well justified." Dawson Rentals is a leading specialist asset rental business operating in several related markets within the European logistics sector. 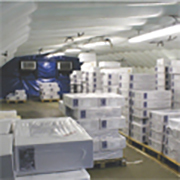 One of our key products is a portable, inflatable cold store which provides businesses with a fast and effective solution when temporary or long term chilled storage space is required. We have been operating these structures for several years and currently have around 80 such units in our rental stock. Tectoniks supply all our inflatable structures and we have enjoyed an excellent relationship with them for many years. They have an unrivalled reputation for delivering high specification, innovative inflatable structures to demanding schedules and we have certainly found this to be well justified. The units have proved to be extremely reliable and robust and the continuing support from Tectoniks has been exceptional. It is therefore my pleasure to recommend Tectoniks to anyone concerned. "We would like to thank you for the effort and confidence put in this Project and we are really confident that this key milestone will be the beginning of a story of success"
On behalf of all the ATLANTE Team, we are really glad to communicate that the ATLANTE First Flight has taken place yesterday morning with a resounding success. Everything worked as expected from the take-off to the landing and some more flight tests will follow during the next dates to check and confirm the full operability and reliability of the whole ATLANTE System. We would like to thank you for the effort and confidence put in this Project and we are really confident that this key milestone will be the beginning of a story of success that will lead into a series production in the near future. As soon as we have further news and we can disclose some relevant information we will contact you again. 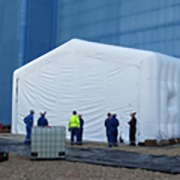 "The station was extremely pleased with this innovation and a brief has been issued across EDF Energy outlining the benefits of using inflatable structures at other locations in the future"
"The refuelling outage at Sizewell B is a multi-million pound project, where Safety, Quality, Time and Cost are key focus areas. Innovations which meet, but do not compromise these requirements are keenly sought. In the Outage which took place in Oct/Nov 2014, one of the tasks that required completion within a very challenging program, was to prepare and paint an Essential Transformer. Normally this would require a scaffold frame covered in sheeting, to give protection from inclement weather and allow heaters to be installed to speed up paint curing times. As an alternative to this, a number of companies were approached to design and construct a bespoke shelter that could be erected and dismantled quickly without the need for scaffolding. The proposal received from Tectoniks for an inflatable enclosure was selected which saved time and money without compromising safety and enabled a better quality paint finish that could have been achieved using traditional scaffold sheeting. From the initial site visit, through all stages of fabrication, to their support for the first installation, Tectoniks demonstrated a high level of commitment and professionalism. They provided regular updates during fabrication which gave us confidence that they would meet our demanding completion date. Any queries that we raised were answered promptly. The resulting enclosure fitted perfectly and was of a very high standard. The station was extremely pleased with this innovation and a brief has been issued across EDF Energy outlining the benefits of using inflatable structures at other locations in the future."